It’s hard to believe that it’s been an entire year since I worked my last full time shift as a nurse to become a stay-at-home mom. I knew when I wrote this post that my life would change, but I had no idea how much it would change. I feel immeasurably thankful that God put this opportunity in my life. That he pricked my heart that night while I was sitting in the bath tub, scrolling through Instagram. That a simple post by a friend about being a SAHM had me in ugly tears (if you’re lost, be sure to read the entire story here.) It wasn’t a feeling of jealousy that she gets to stay home and I don’t. It was an overwhelming feeling that something needed to change and something needed to change soon. I truly believe that God was in control of the timing of every bit of this. So today I would like to share with you a few things that I’ve learned in my first year as a “stay-at-home mom” to toddlers. I’ve found that for my sake and the girls’ that it’s best to maintain a good balance. A balance between a routine schedule and flexibility. A balance between activities out of the house and staying home. A balance of play dates with friends and family time. A balance of one-on-one time with each of them. A balance of screen time, quiet play time, and learning activities. If we do the same thing every single day, we all get bored and frustrated, so I try to mix it up, while sticking to a rough schedule. Even on those days when they are pushing every single button we have and walking on a tightrope that is our patience, we just have to remember that they are only this age for a short amount of time. However, don’t wish this time away by saying “I can’t wait until they’re out of this phase” because when they’re out of this phase they will be older and all the good things about this stage you’re in will be gone. Just try to take it for what it is, and think about all the things that are so wonderful about this age. It is our job to help mold our childrens’ minds and teach them what is right and wrong. It is our job to “train them in the way they should go” (Proverbs 22:3). I’m not always the best at keeping my cool, but I’m working on it. I try to take a deep breath and remind myself that the way I respond to them has an impact on them. The last thing I want is for them to be afraid of their mom. I try to keep this in mind when I feel that I’m about to explode. If there’s not a good reason to say no, try to say yes. Let them be kids, let them do kid things, even if it means it may make a mess. This is imperative to my sanity! Sometimes the constant noise can be overwhelming and you just need a moment to yourself. Raley doesn’t really nap anymore, so while Audrey naps, Raley has “rest time” in her room. She has to stay in her room for at least 2 hours and play quietly. This way, she can slow down and rest, and I have a chance to get some peace and quiet and be productive. Another time of day that I’ve truly come to enjoy is my early morning quiet time. With some encouragement from my friend Erica, I made it a habit to get up about 5:30 each morning, which gives me a good 2 hours before the girls wake up to do whatever I feel like doing. This may be blogging, working on my planner, watching TV or just sitting outside, drinking coffee and listening to the roosters. I like this time because it gives me time to wake up peacefully before the hustle and bustle of the day starts. Find a baby sitter and go do something grown ups do without having to change diapers or break up fights or tell someone a hundred times to sit down in their high chair and eat. Go out with friends, go on a date, have a girls night out…there’s no shame in needing a break to feel like yourself again. I think once a month is a good goal to have for this. Of course you want to capture the sweet moments, but don’t let it keep you from making memories. Live in the moment, enjoy the moment, don’t hide behind the screen. This is something I have to work on. Yall know I’m obsessed with my planners, and a big part of this is because of all the memories it holds. I love writing down sweet and funny things that the girls say. I know that in years to come I can look back in my journals/planners and remember things that I probably would have forgotten otherwise. I understand that this is not always a possibility. There may be somewhere you need to be that prevents you from just sitting down and doing “nothing” for a few minutes, however if it is something you can put off, then take the opportunity. I was in the middle of doing laundry the other day, trying to get the girls clothes put away, and Audrey came up to me and said “Mommy hold you” (one of my favorite phrases, BTW). So I picked her up and sat down with her to watch the movie that was on. She sat on my lap for a good 30 minutes, which is rare for her. She’s usually going-going-going all the time. So even though I was thinking about the laundry and the other cleaning that needed to get done, I tried to put that out of my mind and just hold onto her as tight as I could. There is something about little 2 year old cuddles that just makes your heart melt. So if possible, don’t pass up that opportunity to cuddle while they’re little. This is also something we need to work on. Every day we need to make the time to put the phone down, sit on the floor and just play. Our kids want us to play with them, to notice the things that they do, to be present. We need to let them know that they are important and everything else can wait. For some reason, when my children are separate, they are so much better behaved. I think I have figured out that it’s because they are not competing for my attention so they are calmer and more relaxed. I absolutely love one-on-one time and I think it’s important for the kids to have that time every now and then too. 13. DON’T TRY TO DO IT ALL! And don’t compare yourself to other moms. What That Mom does may not work for you. That Mom may have different strengths than you, but you probably have strengths that she doesn’t have. That mom may seem like she does everything and has it all together, but That Mom has her shortcomings too. None of us are Super Mom, no matter how hard we try, and if we try to be Super Mom, we will end up over-stressed, over-worked, and over-tired. We have to learn to prioritize and don’t put so much pressure on ourselves to do everything and do it perfectly. We have to learn to give ourselves a little grace. It’s so easy for moms to worry. There’s so much to worry about, especially when it comes to our families. But even though it’s hard to let go of that worry and “control,” we have to trust in God’s plan for our lives. Because, who are we kidding? Were we ever really in control? I often find my thoughts spiraling out of control, worrying about what if something happened to one of our girls? What if something happened to one of us and our girls would have to grow up without a mother/father? These are terrifying thoughts. But we have to understand that God has a plan in our lives and it is a good plan. He loves us and He ultimately wants us to live with Him someday. I’m starting to learn (even though I’m still working on fully accepting it) that I don’t have to worry about these things. Something terrible may happen to us. I know that this is a possibility, but instead of constantly worrying, I need to be focusing my energy and attention on living out God’s will and keeping my eyes on my Heavenly prize. So, simply put, the absolute best thing you can do is pray. Ask God to give you patience. Ask God to guide your hand as you are raising your children and teaching them what is right. Ask God to strengthen your relationship with your spouse. The more you pray the more you will feel the “peace that passes all understanding.” (Philippians 4:7) This is one of my favorite verses because we don’t understand the ultimate plan. We will never understand it. But if we trust in His plan we will have peace. So these are a few rules that I’ve learned to live by in the past year, that I hope will be helpful for you as well. I must say, that last point went in a bit of a different direction than I intended when I started writing it, but this is a space where I spill my thoughts and my heart, and I hope that it encourages you in some way! 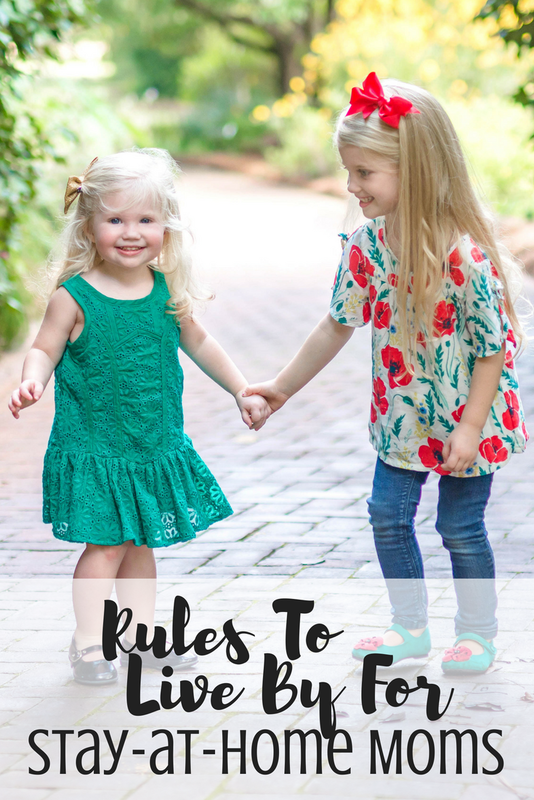 Do you have any rules that you live by as a parent? Do you find yourself struggling in any of these areas as well?